I have sung the Little Drummer Boy to my kids for years now. It is the bedtime lullaby that guarantees lights out. While I was singing it this evening to my daughter, I decided to change the lyrics. Something has bothered me for a while. One of the restaurants in my company is a wine oriented establishment. When we opened the restaurant, our intention was to serve the house wine in small glasses similar to what you might be served in Spain. The intention was to keep the wine approachable and get back to the root, drinking the stuff without getting all gaga goo goo over it. The only problem is that we also serve wines that call for a proper wine glass. Call me a snob, I don’t care. I am a believer. It’s not the size of the wine that matters, it’s all about the glass. I think that if you drink wine out of the proper glass the wine will express itself the way its intended to. Drink Pinot Noir from a pint glass and then drink the same Pinot Noir from a Burgundy glass and tell me if there is a difference. Absolutely there is a difference. The beer guys know it. I “real” beer guy does not drink a Belgium beer from a pint but from a glass shaped like a Pinot Noir glass. If you have not sat through a Riedel wine glass seminar, I urge you to do so. It is uncanny how the same wine served in a different vessel really changes. 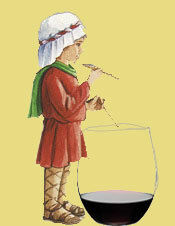 As I lay next to my daughter this evening, singing the words to the Little Drummer boy, I was thinking about how people have sent wine back at the restaurant served in a squatty “water-glass”. Maybe the wine is bad? If so I better change the list. But maybe it’s just the glass. So here it is, the song that drove my daughter into a deep slumber. I have a feeling her dreams will be a bit confusing tonight. I filled some Riedel ‘O’ glasses with Chablis and some with St Aubin. To different levels of course. And with a moistened finger, it was totally possible to play along to the Little Drummer Boy. Can’t do THAT on a nasty thick rimmed glass! Now, should I try the First Noel or should I drink the remaining ST Aubin? You got to send me a recording of it. The little drummer boy lullaby is getting old. My kids need a new one.